Splish, splash, splosh. Do you cycle in the rain or do you just get wet? Cycling in the rain is unpleasant at best, miserable at worst. It’s of little consolation that nobody can see your tears when riding in the rain. Love it or hate it, one thing is for certain, a wet ride is unavoidable even for the most timid of fair weather cyclists. I’ve ridden for days on end in the rain. Or life times, as they seemed to be in my head. Thank you Peak District. You too Lake District. Fortunately your beauty was just about enough to keep me going, although descending the legendary Hardknott Pass in torrential rain is not something I’d like to repeat. Descending wet roads with 30% gradients is worse than climbing them! Did the sky get darker? Here in the UK we have more words for rain than Eskimos* have for snow. Expletives aside, there’s shower, precipitation, drizzle and downpour. More? Oh, all right then. Raining cats and dogs, spitting, torrential, dribble and deluge. Then come the full suite of ‘downs’: bucketing it down, chucking it down, pouring down, tipping it down, pelting it down, lashing it down and my favourite, sheeting it down. In the unlikely event that we forget all of the above, there’s always ‘wet stuff’ as a last resort. * I know, it’s Inuit, not Eskimo, apologies, my language is constrained by the idiom. Non-cycling digression: Some studies suggest Inuits have 180 snow and ice related words. This is somewhat dwarfed by the 1,000 different words they have for reindeer. I reference the Inuit / Eskimo question because to refer to somebody as an Eskimo is to call them ‘an eater of raw meat’ and is perceived to be pejorative. Many years from now perhaps the label ‘cyclist’ will refer to those ‘who rub chamois cream on their nether regions’. Man up, many a cyclist will think when they look through the window at the grey skies and shining roads. Not me. I ride because I want to enjoy it, not suffer it. 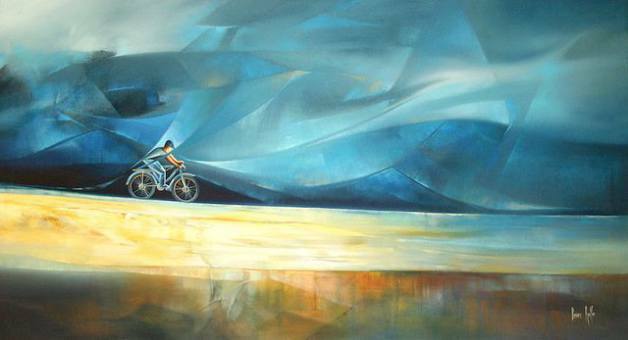 Cycling is about the journey, not the destination. The opposite is true when the heavens open. If riding in the rain was fun then we’d all jump in the shower fully clothed before each ride. I don’t want to feel like I’m wearing a giant, freezing cold, soggy nappy each time I climb out of the saddle. There’s enough to avoid on the roads without having to swerve around puddles or worry about slick manhole covers. Head down, eyes narrow, there’s little scenery to enjoy on a wet ride. Ever get the feeling the rain is stalking you? Is riding in the rain a case of mind over matter? Getting caught in the rain is never as bad as beginning a ride in the rain. 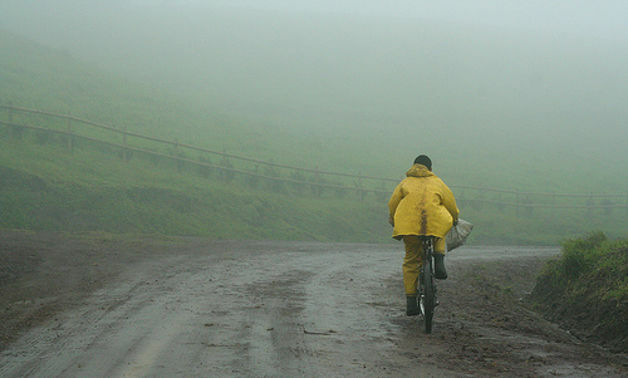 One of my biggest dislikes about cycling is climbing into 99 layers of clothing when it is cold or wet (usually both). Add to that the unpleasant peeling off of the very same layers at the other end and you can see why I try not to commute to work in the rain. The thought of climbing back into wet Lycra for the evening ride is not something I cherish. Susane Colasanti, best selling author of teen novels. Seems cyclists think just like teenage girls when it comes to the rain. No? Just me then. I enjoy riding in the rain under one circumstance. Summer. There are few better rides than the thrill of a quick dousing when a summer storm strikes. 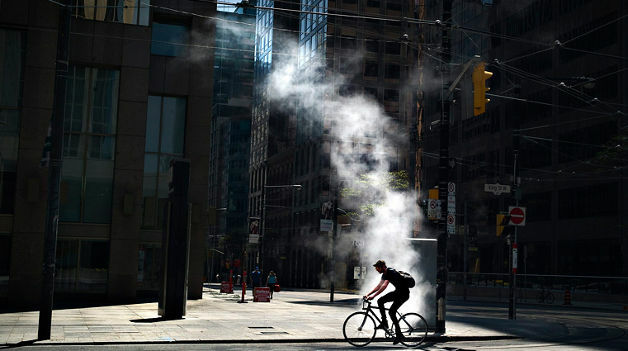 The mercury tops 30 degrees and for once in your cycling life, you welcome the wet. First you smell it. Bright sunny roads soon darken. The sky heaves, ready to belch out rain spots as big as the smile on your face. The hard slap of the first thunder clap sends shivers down your spine. The sprinkle of rain spots promptly form a deluge when the lake above you empties and soaks you in an instant. Saturated yet warm, you ride slower not faster. The sky flashes all around you, lightning, Mother Nature’s camera capturing this moment for her own amusement. Exhilarated, you don’t want to arrive anywhere for this moment should never end. What’s the best clothing for cycling in the rain? Let’s preface this by saying you will get wet. Water always finds a way. Purchase expensive waterproofs by all means but there will always be that gap, that cold trickle to remind you the weather gods shall not be defied. More disconcerting is the uncomfortable feeling of getting wet from the inside out, your sweat trapped by your allegedly breathable waterproof cycling jacket. Despite the claims of many a cycle clothing manufacturer there’s no such thing as 100 percent waterproof clothing. This I believe is called skin. Not that I advocate naked cycling. The more you cycle in the rain, the more you realise the need to invest in some decent gear. When I first began cycling I had little money and so searched for cheap tips on remaining dry on the bike. I cut holes in black bin bags to act as makeshift capes and wrapped my feet in plastic bags. Did such measures work? Sort of. Would I recommend them? No. Decent wet cycling clothing will make your wet ride more comfortable. It’s not about remaining dry, it’s about making yourself less wet. Focus on the core and contact points. 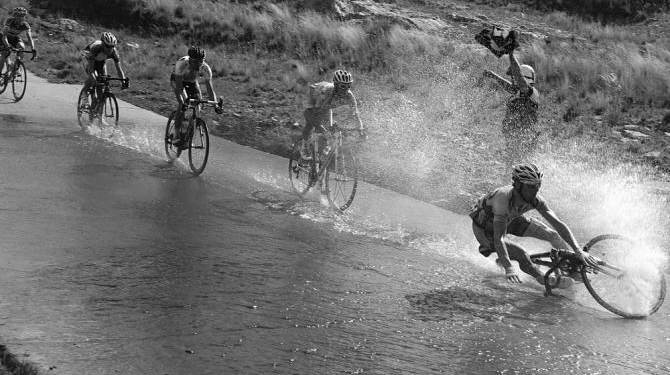 Keeping your body dry is relatively easy but attempting to keep your feet dry when cycling has to be one of mankind’s most futile acts. Others better equipped than I may disagree. 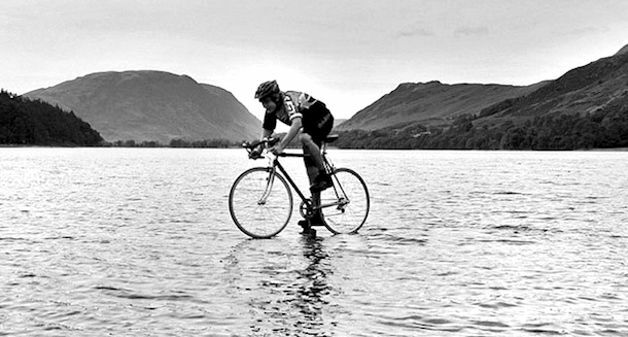 I’m certainly not an all weather cyclist and I often prefer to resort to the best trick of all to remaining dry. Staying indoors. If you must venture out, I would recommend a peaked cap. A visor is very helpful in a heavy storm, protecting your eyes or glasses from the rain. Full mudguards are a must too. The biggest source of water when riding is usually the road and not the sky. Consider mudguards as the cycling equivalent of an umbrella, only pointing in the opposite direction. If your waterproof clothing doesn’t get wet then it can’t fail you. Highly recommended, unless you like rocking the skunk stripe of course. Top tip: the best way to dry wet cycling shoes is to stuff them with newspaper. Is cycling in the rain bad for my bike? Yup, but the damage is less than that inflicted upon the cyclist’s soul. Bike maintenance is certainly the last thing you want to do when you arrive home looking like a wet rat. Fortunately there’s not a great deal of maintenance for you to do. Oiling the chain is the bare minimum, especially if you’ve just cycled through a biblical storm so heavy the paint was almost stripped from your frame. You could wipe your bike down with a towel if you were so inclined. Or clean it thoroughly. Or you could simply have a nice warm shower and a hot pot of coffee. Wet roads can be lethal. Traction between tyre and road is reduced and corners quickly become enemies. So too the dreaded manhole or drain covers that need treating as carefully as ice. You’ll only attempt to turn on a wet drain cover once in your life. Avoid them completely or make sure you hold a straight line. Braking is also greatly reduced in the wet. Caliper brakes and rain are about as useful a combination as frozen hands and a puncture. Slowing down might be the last thing you want to do in the rain but it’s better to return home extra wet than extra sore. Avoid puddles and standing water as you never know how deep the water is or what lies beneath. Watch out too for the painted lines on the roads, which can steal a wheel from beneath you quicker than a bike thief at a sportive. Heavy rain helps clean city roads but be vigilant with light rain, especially in the summer. Cycling on damp dusty roads can be akin to someone dousing your tyres in baby oil. Confidence is important too. As anyone who saw Bradley Wiggins trying to descend a mountain in the wet after a fall in last year’s Giro will understand. Visibility is also important. Get your lights on and avoid dark clothing. The best bike handler in the world is powerless if sideswiped by a driver who hasn’t seen them in dreadful conditions. Most cyclists advocate upgrading your tyres as one of the best investments or upgrades. I concur. This is especially true when riding in the rain. I’m a fan of Continental tyres, either Four Seasons or GP4000S. No matter what tyre you ride, be sure to inflate it to the correct pressure, by which I mean do not follow the max PSI as recommended by the manufacturer on the side of the tyre. Follow the rules of ‘tyre drop’, which uses your weight to calculate the optimum tyre pressure. You may even want to go to a lower pressure when it rains or switch to some wider tyres. The current vogue for road bikes is moving from 23mm to 25mm tyres. In the dry you probably won’t even notice the difference (I don’t) but these two vital millimetres might just save you a slip in the wet, which can be bad for your bones, your bike and ultimately, your dignity. I think relief is the key emotion for me rather than exhilaration when I see the sun coming out! No indoor trainer here either – I keep thinking about it but just know it would be bore the life out of me. Better to be either damp or forgo cycling altogether rather than punish yourself! Buffalo P system top, cyclocross bike with disc brakes and mudguards and a positive attitude makes a big difference. Forget about trying to keep dry and just stay warm. Voila! Rain i can live with (if i have to), but i draw the line at wet and windy. Which unfortunately rules out much of January! Entertaining post as usual, nice one. 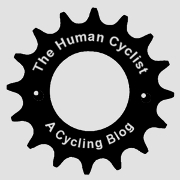 A most enjoyable post that had me laughing too ‘You must be mental’ – how many times have I said that to myself when caught cycling in the rain? Countless, though I, like you, avoid the stuff whenever possible. I find a baseball cap under my cycling helmet works best for me. Thank the gods for peaked caps. Thanks sonmicloud. Having just returned from a wet drubbing of biblical proportions I must take my own advice more often. Moist. Oddly, the article does not mention additional lowering of tire pressures in wet weather. I generally reduce tire pressure by 10 PSI in wet weather. Hi Glenn, that’s a good idea if you ride with high tyre pressures in the dry. However as mentioned in the blog I’m a fan of using the tyre drop method to inflate my tyres which means you ride at lower pressures all year round. It’s more comfortable too! The recommended tyre pressures are usually way too high and only really necessary if you cycle indoors on a beautifully smooth track (the dream surface!). Nice blog. So tender and lovely from text to pictures. The author must be a girl. Wrong? Thank you Fei Yang. You are indeed incorrect! Accurate description of the ride I did today – those were the longest 40 miles I’ve had in a while! Ah yes, weather here in UK has been miserable today, I awoke with the birds at dawn to avoid the wet stuff! PreviousMore cycle paths or fewer psychopaths?